The Indiana IT Symposium is the region’s annual major gathering of leaders, professionals, and academics working in the I.T. field. Sponsoring vendors have the opportunity to share information about problem-solving technology and ideas local executives can use in their day-to-day business practices. Dr. Natalie Stavas, Physician at The Children’s Hospital of Philadelphia will present the closing keynote for the day titled “Running Towards Chaos”. Natalie’s philosophy for success is…. “You Run Towards.” This philosophy was never more apparent than on April 15th, 2013. She had ran 26 miles and was about to finish the Boston marathon when the bombs detonated. Instead of turning around and running, she ran towards the chaos and saved 4 lives. The Indianapolis chapter of the Society for Information Management (SIM) announces the 9th Annual Indiana IT Symposium is returning to Indianapolis, Indiana at the Indiana Convention Center on September 12, 2018. This is a one-day, executive-level event designed for CIOs and their management teams. There will be nearly 200 CIOs, VPs, Directors and Managers present at this year’s Indiana IT Symposium. The Indiana IT Symposium is the region’s annual major gathering of leaders, professionals, and academics working in the I.T. field. As technology continues to redefine the boundaries of industries and replace markets’ traditional geographic regions with borderless digital environments, it has become essential for local organizations to be aware of the global trends in their sectors and implement strategies to integrate them into their operations in order to be able to stay agile and maintain their competitive edge. This year’s symposium will look at emerging I.T. trends and provide insights into innovative leadership skills in today’s fast-paced digital age. This interactive event will also provide attendees with opportunities to collaborate and share their knowledge and experiences through a series of panels, break-out sessions, and social media. Doug Keeley, CEO & Chief Storyteller at The Mark of a Leader, will present the opening keynote “Harnessing the Power of Five Level Stories to Drive Performance”. Doug will also serve as Master of Ceremonies for the day. Keeley is renowned for his “tour de force” keynotes that inspire better performance and stronger cultures by leveraging what he calls “Five Level Stories”. In this keynote, and through the day, Doug will use stories from his incredible video library to inspire you to create a culture of leadership, and challenge you to replace your “decks” with stories that stick and cause people to change behavior. He will give you practical tips to put both into action. Bob Stutz, CEO Marketing Cloud and Chief Analytics Officer with Salesforce, will deliver the lunch keynote presentation, formatted as a Fireside Chat, titled: “Salesforce Initiatives in the Indianapolis Market”. In this presentation, you’ll hear Bob discuss the history of Salesforce, where they are now and where they’re headed in the Indianapolis market. Dr. Natalie Stavas, Physician at The Children’s Hospital of Philadelphia will present the closing keynote for the day titled “Running Towards Chaos”. An avid runner, Natalie’s philosophy for success is “You Run Towards.” This philosophy was never more apparent than on April 15th, 2013. She had just run 26 miles and was about to finish the Boston marathon when the bombs detonated at the finish line. Instead of turning around and running away with the crowd, she ran towards the chaos and saved 4 lives that day. 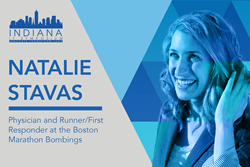 Natalie Stavas attacks every obstacle with the same attitude: “You run towards that which you fear, that which challenges you, that which is oppositional.” Natalie speaks to audiences about her experience as a first responder and what ultimately led her to make that fateful decision to run into a terrorist attack. In addition to the three keynotes, there will be 12 breakout sessions and panels throughout the day focused on security around the Cloud, data analytics, staff development, diversity in technology, machine learning, cloud computing, virtual reality, regulatory compliance, Blockchain, and the latest technology products. Attending the 2018 Indiana IT Symposium is an opportunity for leaders engaged in Technology to network and explore new ways to maintain competitive advantage in a global economy. The ability to collaborate and exchange actionable information with peers makes this event rewarding and productive. If you and your team would like to join us for a great day of education, networking, collaboration and celebration, please register your team at http://www.indianaitsymposium.com. NOTE: This event is closed to all non-sponsoring vendor companies, sales reps and consultants. For sponsorship information, please contact Brian Gargano at brian@efminc.com.